Our best selling big-game and predator hooks! Top choice for big pike and musky flies! A monster hook designed for tarpon, billfish and other super large gamefish. 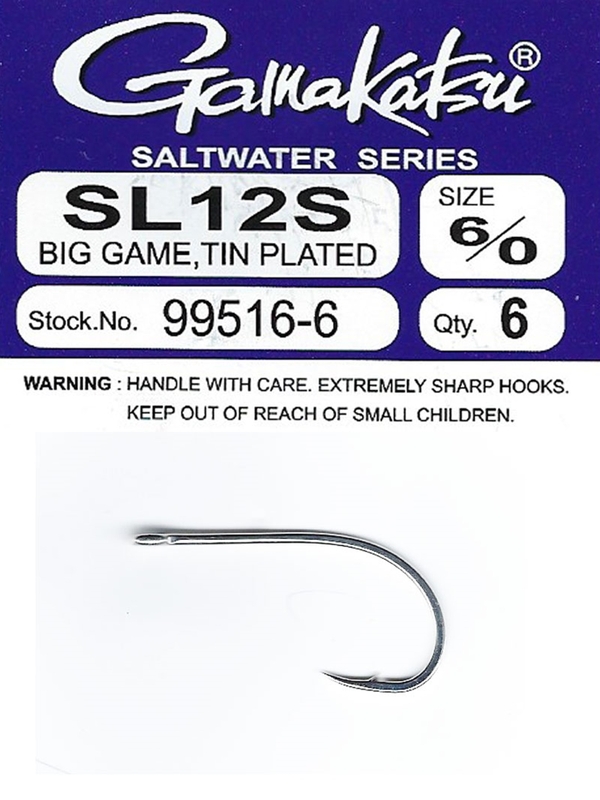 The Gamakatsu SL12S is a tin plated, high carbon steel hook that has been tempered to perfection. Gamakatsu is the leader in saltwater hooks and this is the king of their line! The guys around here are using these for their monster musky flies also!! Our best selling predator hook! Gamakatsu fly tying hooks offer sport fishermen the ultimate in design, the finest quality steel and unequalled workmanship. Far more than just another sharp hook, Gamakatsu has set the standard that others strive to achieve. A fine rod and reel is an investment in fishing pleasure, but Gamakatsu hooks are an investment in success. Finally, a hook worthy of fishermen who will settle for nothing less than the finest. The Gamakatsu SL12S fly hooks- 4/0 come 7 to a pack, 6/0 6 to a pack and the 8/0 and 10/0 come 4 to a pack.